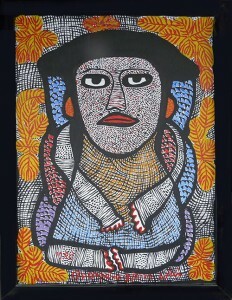 Anyone who is committed to Haitian art has books to support this interest. From time to time, I will analyze the books in my personal library that expose Haitian art in creative ways. “Veve: Ritual Art of Haitian Vodou” (2005 from ReMe Art Publishing and Sandra Osse) by Nancy Turnier Ferere, with an introduction by Gerard Alphonse Ferere, is a full-color, hardback book with an abundance of illustrations. It is one of the best books for identifying veves — the ritual drawings made on the floors of Vodou temples from easily sifted materials through the fingers, like flour or coffee grounds. Naturally, the artist in Ferere cannot help but add her own imaginative flourishes to these designs symbolic of the lwas or spirits in the Vodou pantheon. I know from my other books that Ogou Feray is associated with war and victory in battle. His favorite colors are blue and red, the colors of the Haitian national flag. The lwas have definite preferences. But they act on people’s behalf by returning favors for obedience to their demands by influencing romantic relationships, the fate of crops, matters of justice, and economic prosperity, among other important areas of life. Vodou is Haiti and Haiti is Vodou, an inextricable linkage worthy of celebration. 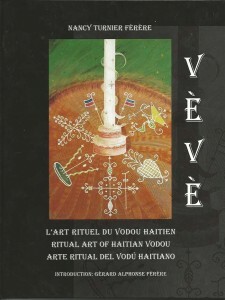 This exemplary book only adds to the serious literature on the subject and the art of Haitian Vodou. This is the final installment of a story begun two weeks ago about murals created in Haiti immediately after the return of Jean-Bertrand Aristide to the presidency of Haiti on October 15, 1994. It was published eight days afterward in the Sun-Sentinel newspaper in Fort Lauderdale, Florida. The mural tradition is long-standing; it is found in some Haitian interiors, specifically Vodou temples, or hounfots. Since the vast majority of Haitians believes in Vodou, Catholicism, or a combination of the two, they are familiar with the images of Haitian Vodou spirits painted on temple walls or geometric designs known as veves that are symbolic of them. The murals that prediated the two historic “freedom” events, if not religious, had to be subtle. LeGrace Benson, who is researching iconography, has visited Haiti since 1981. In that year, she saw her first exterior mural near downtown Port-au-Prince, next to a road construction project. This mural was a discreet expression of desire for change, so unlike the murals of overt messages being painted now. Celestin, of course, is not the only mural maker celebrating this directness. Murals by others, such as Anantua Michelet and Ronald Perou, are similarly pointed. Perou’s political mural is also found on the airport military wall; it’s dated October, 1994. The burning of Saint-Jean Bosco church is portrayed in the background hear a cache of discarded knives and other weapons. Five people hold tiny Haitian flags on the other, present-day side of the mural, next to a map of Haiti bearing the words justice, peace, development, democracy, and reconstruction. Over them flies an aircraft with a rooster’s face, symbol of Artistide. The aircraft is named Lavalas Air, a reference to Aristide supporters in a movement called “lavalas” or cleansing. It is a portrait of hope, with Aristide in charge. Provoking assent or dissent, the murals are helping to establish a new political identity for Haiti at a significant time in its history. Benson knows that these murals represent a profoundly felt passion. This is a continuation of a story begun last week about murals created in Haiti immediately after the return of Jean-Bertrand Aristide to the presidency of Haiti on October 15, 1994. It was published eight days afterward in the Sun-Sentinel newspaper in Fort Lauderdale Florida. The story is intended to celebrate the contagious joy of artists allowed to express themselves after years of political upheaval and oppression. The wall of murals faces City Soleil, or Sun City, infamous as the poorest slum in the capital. Last Sunday morning, as Charlemagne Celestin, 29, worked on a twin portrait of Aristide and U.S. President Bill Clinton, churchgoers and other passers-by stopped to watch and comment. For Celestin, an Aristide supporter, this mural is the sixth in a series he has completed in a matter of days. These murals are his first works after three years spent in hiding from the pro-military attaches. With the departure of Lieutenant General Raoul Cedras, Celestin felt free to begin work. His most detailed mural depicts the 1988 massacre and burning of the Saint-Jean Bosco Church, where Aristide used to preach. At least a dozen people were killed and more than 70 others injured in the attack. Though Artistide was the target of the attack, he escaped without harm. In Celestin’s mural, the face of Aristide floats in a small cloud above the church. He somberly watches people running from the church, climbing walls for escape, and lying on the ground. Particularly disturbing is the sight of a pregnant woman in a white dress and kerchief with her hands raised. Her bleeding belly is being sliced by an attache in a red armband. Everywhere is chaos. Celestin’s work reflects the currently favorable view of Americans as liberators. His point of view is reflected in a telling mural a few yards away from his other works. Celestin’s fantasy of political redress is reflected in another mural in this series. In front of Brigadier General Philippe Biamby and police chief Michel Francois, key henchmen of the coup that overthrew Aristide, Lieutenant General Raoul Cedras kneels with head bowed. But his head is bowed before Aristide, who is in priestly garb. The contrite head of the Haitian military and coup leader (now living in Panama) begs for forgiveness as Aristide blesses him with a hand-held cross. This story was published in the Sun-Sentinel newspaper (now the South Florida Sun-Sentinel) in Fort Lauderdale, Florida, on October 23, 1994 — eight days after Jean-Bertrand Aristide was restored to the presidency of Haiti. He had been deposed as the country’s first democratically elected leader and returned from living in exile. The story was inspired during a drive from Port-au-Prince on a Sunday morning, the day after Aristide’s triumphant return to the National Palace by helicopter with the help of the U.S. military. Graffiti was everywhere, extolling the happy news of the change in government. Murals were being created, sometimes with written phrases. I asked my friends to stop the car, so that I could photograph the murals and talk to the artists in the process of painting them. While I didn’t want to miss my flight home to Florida, I couldn’t pass up the excitement of these brand new artworks extolling the joy of the people at Aristide’s return. My story in the Sun-Sentinel was the first in the U.S. to cover these extraordinary political murals of Haiti, some with the paint still wet. PORT-AU-PRINCE, HAITI — On concrete walls throughout Haiti’s capital, history repeated itself last week. As they had nearly a decade ago, another time of hope for a silenced people, political murals in bold colors suddenly appeared everywhere. The murals, freshly created and diverse in expression, are inspired by the return of President Jean-Bertrand Aristide, after his three-year exile. In 1986, it was a leader’s departure that prompted the same type of visual outpouring, throughout Port-au-Prince, Jacmel, and other cities. That is when President Jean-Claude “Baby Doc” Duvalier and wife Michele fled the country, ending 29 years of a ruthless dictatorship. It also suggested the possibility of free elections some day. Then, as now, mural makers, untrained artists of passionate conviction, were busy. The Haitian national flag from the pre-Duvalier days was re-installed in 1986. Its colors, red and blue, were painted in a burst of patriotism on curbstones, houses, and tree trunks, along with the Haitian coat of arms and a new meaningful motto, L’Union Fait La Force (Union Makes Strength). Now, the freshly painted murals in Port-au-Prince forecast a new day of hope and reconciliation under Aristide, the former Catholic priest with vast support among the country’s poor. They elected him by a margin of 70 per cent, marking their ballots next to the red rooster that is his symbol. Like that symbol on the ballot, these vivid wall paintings speak to the overwhelming majority who cannot read or write. The most dramatic murals in the city are not even two weeks old. They are painted on a gray concrete wall surrounding the Haitian military airport. The top of this wall is lined with barbed wire and sandbags, evidence of the current residents behind the wall — U.S. troops. A few soldiers in fatigues and helmets peeked out of a concrete watchtower, casually talking and laughing with Haitians on the other side. In front of this wall is a narrow drainage canal. To get across requires careful maneuvering over a makeshift ladder. A widely spaced row of trees, their trunks painted white, offer no shady respite. A white goats rests in a rusting wheelbarrow. A boy in blue shorts sleeps with his mouth open on a bench. It’s unbearably hot, dusty and noisy from the passage of traffic — this is one of two main roads to Haiti’s International Airport. The conditions may be far from ideal, but it’s a perfect place for the creation of popular art to be seen every day by hundreds of Haitians and visitors to Haiti. (Look for Part Two of this story next weekend). Saint Soleil master Prospere Pierre Louis is one of Haiti’s greatest artists. His largest paintings are triumphs of exciting color combinations and forms that depict the process of transformation beginning witih the genesis of life, when sperm meets egg. “Pensive Figure” (late 1980s), an acrylic on canvas measuring sixteen inches by twelve inches, distills everything that collectors admire about his work. Cross-hatching in black on a white ground and black for the beret worn by the single figure are typical touches. But it is the pops of color, judiciously placed, that elevate the painting beyond the ordinary. Red, orange, yellow, purple, and blue enliven the composition. Louis differentiates the top portion of the figure in orange and the bottom in sky blue. Its ears are yellow with orange marks, as are the natural elements, like the variegated leaves on bushes that surround the figure. This exemplifies the well-known Haitian reverence for nature and its capacity to sustain life. For the androgynous figure’s lips, drawn closed in enigmatic resolve, the artist employs the boldness of red. It is as used as well for painted fingernails and toenails. Encasing designs in purple and blue surround the figure, as if it is still in the womb and protected from the outside world. The arms, disproportionate to the body, are thrust forward, with hands on belly and nearly clasped, as if in contentment. The legs are less well-formed. Tucked under the body, they appear not as long as the arms, though they are of the same width. It as if Louis wants all the attention to go to the face with the steady, unwavering gaze. Benign equanimity is the term that best describes the expression worn by the near-human in “Pensive Figure.” This resolve speaks to the core of the Haitian character. Visit Haiti and the evidence is all around — Haitians are hard-working, determined, and resourceful. They are not complainers. They are not whiners. They don’t take pills to get through the day, like so many millions of people in Western countries with far more money and resources. An artist as esteemed as Prospere Pierre Louis, one imagines, would do his best work in a large format. In fact, the larger, the better. And the large works by Louis are uniformly excellent, with each one different and compelling in its own right. A painting by him merited the cover of Selden Rodman’s “Where Art is Joy: Haitian Art, The First Forty Years” (1988). But I honestly cannot say that the larger paintings are better than the smaller ones. The fact is this: Louis can work his magic just as ably when working small. Rare is such an artist, by the way. I own a few of his small paintings, all measuring sixteen inches by twelve inches, some horizontally placed, others vertical. I never saw a painting by Louis any smaller than this. All of these paintings are totally distinct, yet instantly recognizable as being from the artist’s hand, with figures outlined in black against a ground of color with natural elements. “The Pensive Figure” shows the passivity and acceptance of growing into a sentient being. The Saint Soleil artists understand this essential mystery of life like no other group of Haitian artists. This divinely inspired painting by Prospere Pierre Louis distills the characteristics of his style at its best.